Clerks, Back to the Future, Bill and Ted, Ghostbusters, and Men in Black are just a few live-action films that have been turned into animated series after the movies left theaters. Some of these were more successful than others, but here's a series that almost certainly would have been a big hit if it actually existed. 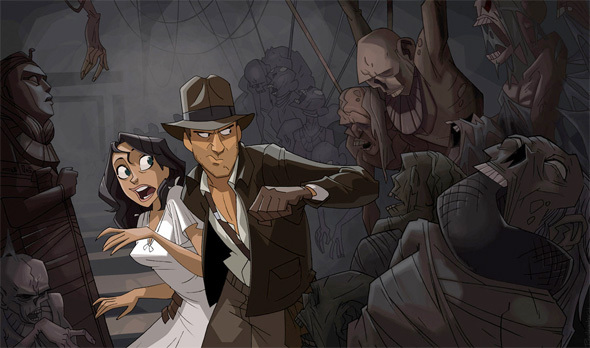 Artist Patrick Schoenmaker (via GeekTyrant) created an awesome series of drawings for a show that never was, called Indiana Jones: The Animated Adventures. Because this artwork is so terrific, it only takes a little bit of imagination to picture Dr. Jones, Short Round, Marcus Brody, and Indy flying into action. Look! This would have easily been one of my favorite Saturday morning cartoons growing up if it were real. Schoenmaker has a great style, and this looks totally believable, as if it were abandoned concept art for a real series. Some say that "Star Wars: The Clone Wars" is a better version of the saga than the live-action prequels, so perhaps he should talk to Paramount Pictures and George Lucas about turning this into a reality so fans can wash the bad taste out of their mouths left by Kingdom of the Crystal Skull. Good stuff? The horrible after-taste of Crystal Skull is back. Where are the nazis? You can't have a proper Indiana jones without the nazis. These are great. In an animated Indiana Jones series, the nazis would have to be replaced with neorenegades. No cable network would allow the animated show to be on the air if nazis were in there- neorenegades would take the place of the nazis, thus making the show politically correct. I don't think Crystal Skull is nearly as bad as everyone makes it out to be. There were parts I thoroughly enjoyed and no need to remind me I'm in the minority. Snakes would be allowed in the show- standards and practices wouldn't object to that. I would have watched the hell out of this growing up. You know what, I'd watch the hell out of it right now. Kickstart this thing! I can see the influence of Don Bluth in these. this needs to get made as soon as possible, don't call Lucas, call Spielberg. if they can get good writers and stick this art style and this era of Jones life then i'd definitely be watching this show every day it came on. Sadly i think saturday morning cartoons have died unless you have cable but either way this looks awesome. 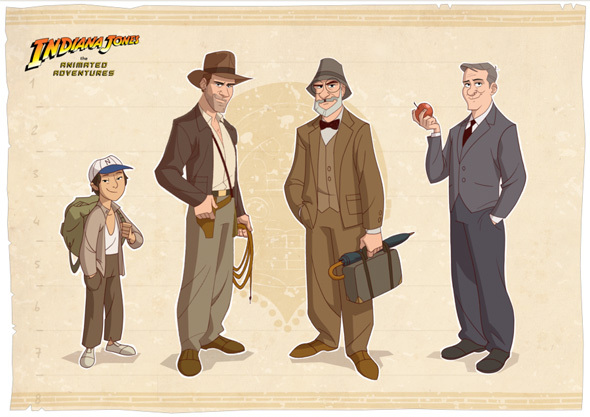 Not possible- both George Lucas and Steven Spielberg need to be on board for an animated Indiana Jones series, and both men need to talk with Paramount Animation and CBS Studios about getting it made. Spielberg can get writers like Paul Dini, Rich Fogel, Gerry Conaway, etc. to pen the episodes for television, while Lucas handles the production part. It has to be both Lucas and Spielberg, because it can't be one or the other. Would be great until Lucas starts messing with them..